(Phys.org)—A combined team of researchers from several institutions in Japan has found evidence that suggests Pluto's distinctive red spot may have developed after a massive collision with a comet or other object. In their paper published in the journal Nature Astronomy, the researchers detail experiments they conducted that showed that the red spot on Pluto may have come about due to pools that developed on the dwarf planet's surface after a collision. Ever since the New Horizons probe passed by Pluto back in the summer of 2015, space scientists have been curious about the nature of a very dark reddish patch (subsequently nicknamed Cthulhu Regio) that could be seen on its surface in the new images. Some suggested it was likely due to an impact and the red material was the remains of the other object. But subsequent study has revealed flaws with that theory. In this new effort, the researchers started with the assumption that if an object such as a comet struck Pluto, it likely had some organic compounds in its makeup—as did Pluto itself. In such a collision, they reasoned, the huge amount of heat generated would have resulted in pools of liquid forming on the surface. As time passed the liquid would have cooled into rock—dark red rock due to the organic compounds in it. To test their theory, the researchers conducted experiments in which they heated different "soups" they made with various organic materials for several hours and then let them cool to see if they might resemble the material seen on Pluto. The team reports that several of their soups did cool to resemble the images of the red spot on Pluto—soups that had been heated for over 1,000 hours and to temperatures of 122F° or higher. The researchers then used conclusions from their experiments to create computer simulations. 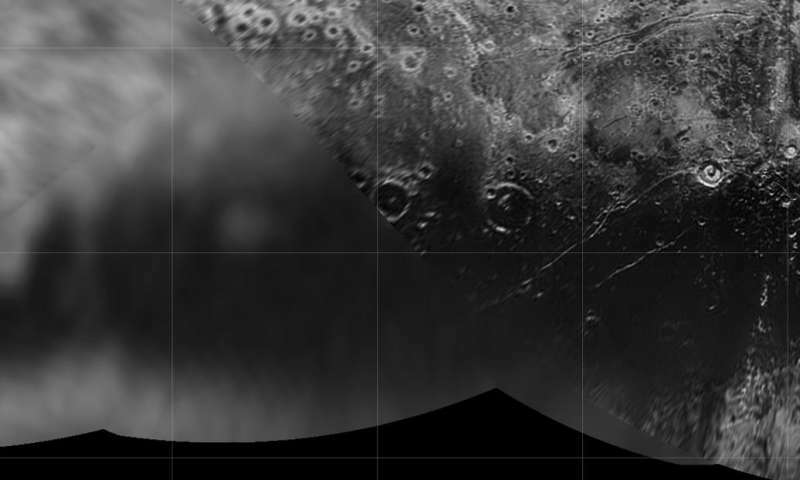 They found that such a collision appeared possible, and that if it were large enough to create the amount of material found on Pluto's surface, it would have been big enough to give Pluto its current tilt; it might also have spawned Pluto's moon Charon. They also suggest similar collisions occurring throughout the solar system could explain the wide color variation seen on large bodies in the Kuiper belt. Pluto exhibits complex regional diversity in its surface materials. One of the most striking features is the dark reddish material, possibly organic matter, along Pluto's equator coexisting with the H2O-rich crust. Little is known, however, about the surface process responsible for the dark equatorial regions. 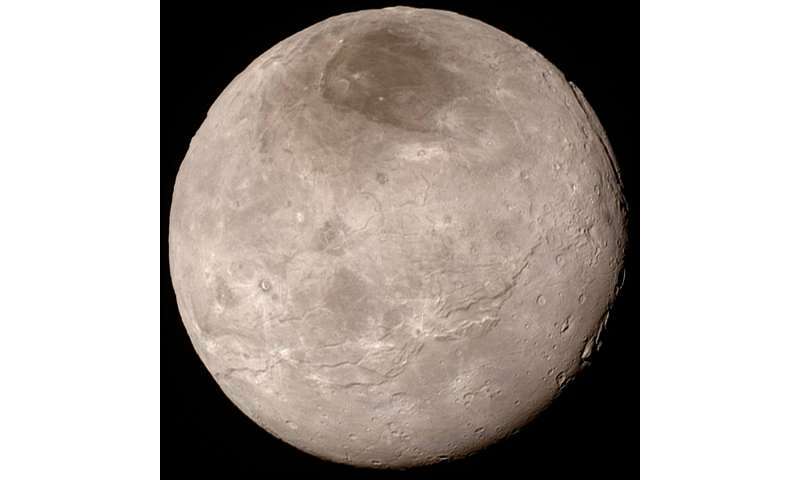 Here, we propose that Pluto's dark regions were formed through reactions in elongated pools of liquid water near the equator, generated by the giant impact that formed Charon. Our laboratory experiments show that dark reddish organic matter, comparable to Pluto's dark materials, is produced through polymerization of simple organic compounds that would have been present in proto-Pluto (for example, formaldehyde) by prolonged heating at temperatures ≥50 °C. Through hydrodynamic impact simulations, we demonstrate that an impactor, one-third the mass of Pluto, colliding with proto-Pluto—with an interior potential temperature of 150–200 K—could have generated both a Charon-sized satellite and high-temperature regions around Pluto's equator. We also propose that high-velocity giant impacts result in global or hemispherical darkening and reddening, suggesting that the colour variety of large Kuiper belt objects could have been caused by frequent, stochastic giant impacts in a massive outer protoplanetary disk in the early Solar System.